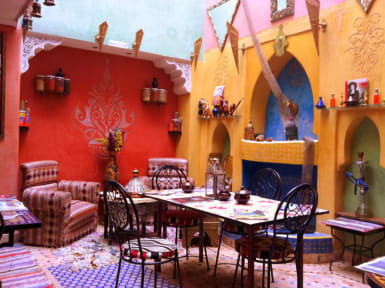 Riad Layla Rouge kohteessa Marrakech, Marokko: Varaa nyt! Layla Rouge was an epicly great experience. The staff was amazing and you really felt like you would've stayed with a family. Everyone was really helpful and the dorm was super cozy. The only downside was that the amount of power outlets was a total of three for eight people but we still got by well. It was very safe and the location was great. Would recommend 100%! Definitely coming back.